In early May I received an email, an inquiry about availability of duck eggs. Our small flock of ducks produces a steady supply of eggs..not a ton, but steady. Kevin showed up to get them. I was, of course, curious about why he needed a steady supply of duck eggs. It is an unusual request from someone who is not a baker. Kevin turned out to be one better than a baker..at least in my world. An ice cream maker. And the best ice cream. Ever. I know, because I have tried them all. When I traveled the country I'd always look for local ice cream and try it. I've always said if I could eat ice cream 3 times a day I would. Kevin takes duck eggs (and our occasional contribution of cream or milk) and produces extraordinary ice cream. Mint chip from..mint plants..not mint extract..and real, rich, dark chocolate. Coffee from delicious coffee. Ginger from..ginger..honey with our honey (a double treat! )..strawberry from in season, the vendor next to us at the market strawberries.. So imagine..we clear our schedule when this email arrives after midnight last night..
"When/where are we meeting? I work all day on Friday but am free all weekend. I made you guys some pumpkin ice cream. Give it to you when I see you." Rest assured, we will find him this weekend. I promise not to hunt him down at work today, but tomorrow all bets are off. He has ruined me for other ice cream. Just no where near as good. That might be the duck eggs talking. 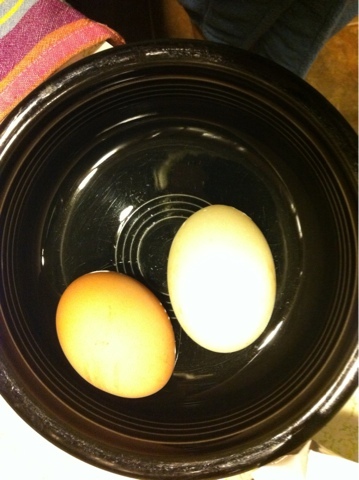 The duck egg is bigger. And better for concocting richer ice cream, according to Kevin. I'm in.